Block 21 has a distinguished place in Chicago's history, both for its landmark Water Tower and Pumping Station that survived the Great Chicago Fire of 1871, and for its location as the source of the young city's first fresh water. Also, the early nineteenth-century development of the surrounding affluent Streeterville neighborhood and then the mid-twentieth century addition of the John Hancock Center have maintained the region as an international tourist destination. 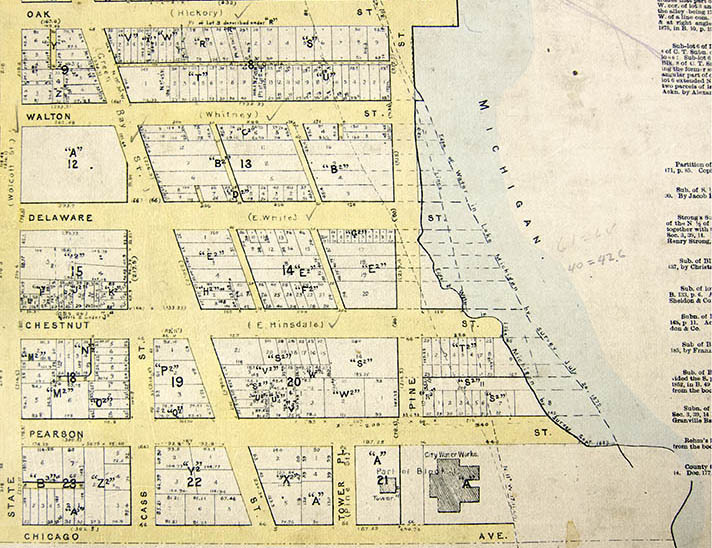 This section of the Shifting Grounds website explores the development of the area from its first appearance on a surveyed map to the establishment of the Great Chicago Lake Tunnel and the connecting Water Tower and Pumping Station. The image on the right is from the 1872 Peltzer's Atlas of Chicago. As with survey plats that notate the land's changing history, this map shows dotted lines that represent three earlier shorelines and the irregular endings to the existing streets. Lake Shore Drive, which connected Lincoln Park to Pine Street (today's Michigan Avenue) juts out at the map's top edge. At the bottom, the map illustrates Pine Street's evacuation that combined the land of the water tower and pumping station, and the newly formed Tower Place. The two structures were separated again in 1926 when northbound Michigan Avenue pushed through and southbound traffic circled west of the tower. The entire section of this map to the right of the diagonal Green Bay Road (today's Rush Street) was the ground of Chicago's earliest cemetery. See the 1836 survey map in the menu bar, above. Courtesy of the Illinois Regional Archive Depository (IRAD) at Northeastern Illinois University.